When a young veterinary student jumps onto a passing train, he falls into an extraordinary world of magic and madness. If you’ve ever wanted to run away with the circus, Water for Elephants might make you think twice. Set in the 1930s, which was pretty much the golden age for circuses, this screen adaptation of Sara Gruen’s 2006 bestseller delivers up all the spangled glamour of the big top alongside some brutal realities of life behind the canvas. Told as one big flashback, the film is book-ended by scenes featuring Hol Holbrook as the 93 year old Jacob Jankowski. But it’s young Jacob’s story of the dramatic love triangle that he found himself caught up in that forms the heart of this piece. Twilight’s Robert Pattinson is the vet student cast adrift after his parents die in a car crash. With nothing to keep him at home, he hitches a ride on steam train which just so happens to contain the cast and crew of the Benzini Brothers Circus. You can almost smell the sawdust and manure in the rear carriages with all the animals and freaks crammed in cheek by jowl, but up the front of the train the pillows are plump and the champagne flows. Christoph Waltz, who won a Best Supporting Actor Oscar for his gripping performance as the Jew Hunter in Quentin Tarantino’s Inglorious Basterds, again dominates the screen here as August, the sometimes sadistic ringmaster. August’s prize possession is his star attraction Marlena, a platinum blonde Reese Witherspoon, who works with performing horses in the ring. But when August enlists Jacob as the circus vet and entrusts him with training a stubborn elephant for Marlena to ride, he lays the seeds for his own destruction. We’re told at the start that the Benzini Brothers Circus had the most famous circus disaster of all time and this drum roll echoes quietly throughout the film as Marlena and Jacob are drawn to each other through their love of animals. Starting off as a slow burn it gradually intensifies and August’s suspicion grows. When we discover that this is the kind of showman who orders people be thrown from speeding trains at whim, our fears for the young couple grow. This is not someone you want to be around when his jealousy boils over. 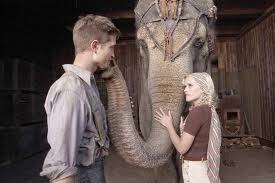 Water for Elephants draws you in to the wonder of the old fashioned circus world with spectacular Art Direction by Jack Fisk and gorgeous period costumes by Jacqueline West. There are some dazzling sequences with Marlena and her horses, and with the aforementioned pachyderm too. There are also several moments that are difficult to watch. But the end credits assure us that no animals were harmed in this film, which was directed by Francis Lawrence (I Am Legend). As August says; “The world is run on tricks”. It’s how you play that counts.